Color can seem to be such a mystery when it comes to clothing. There are some people out there who seem to have it all together, who seem to be dressed perfectly all of the time - and then there are the rest of the people, the ones who can’t seem to figure out what shirt goes with what pair of pants. So, to help out with that, to make color-coordinating easier for men’s clothing - here are some suggestions on how best to match colors when putting outfits together. Colored pants really don’t look good on men. Keep your pants a basic, neutral color—black, or some shade of grey, tan, khaki, or brown will do nicely and will be simple to match. Or, if you are dressing for a casual day, jeans would be great! Since you have chosen neutrally-colored pants (or jeans), the rest of your outfit will not be difficult to choose as far as colors go. If your pants are black or grey, stay away from shirts that have any shade of brown in them as these will not pair well. Pants that are tan, khaki or brown or jeans can be paired with just about any color of shirt. When choosing a shirt color, though, it is wise to avoid choosing a shirt that is very close to the exact color of your pants or jeans. When you wear a shirt and pant of the same color, it looks like a uniform. Opting for a pattern on a shirt is fine, just keep to a minimal pattern and make sure that everything else that you choose is neutral. Socks should be close to the color of your pants. As for shoes, avoid brown shoes unless you are dressing casually; business work attire should be accompanied by black shoes. Light colors (pastels) should be paired with dark grey or black pants. Wearing a pastel shirt with, say, tan pants might just make you look like an Easter egg. Two bright, vivid colors should not be worn at the same time—choose only one. Otherwise, your outfit could induce headaches in passersby. Wearing different shades of one color from head to toe is a good idea. For example, wearing a pair of navy pants, a light blue button shirt, and a dark blue cardigan would look quite nice. For performing some sort of practical function, like a watch to check the time, and for boosting your outfit stylistically, like cool shades or designer cufflinks. When accessories are worn with the intention of standing out in a crowd, they can really make one’s outfit a class apart. If you want to make an individual style statement, then accessories in the form of a scarf or a simple necktie can create a dramatic impact. The modern man is fast realizing the importance of accessories in his wardrobe. A good one can transform even the most mundane outfit and rather than discarding those outfits worn nth number of times why not enhance it and give a new look by adding some trendy accessories . Eyewear - Increasingly, eyeglasses are being taken up as fashion accessories for men of all ages. Adding eyeglasses to one’s outfit can have the effect of making you look more sophisticated and classy. Non prescription lenses are mainly used in eyeglasses used as accessories so as not to deform the vision of those wearing them. Sunglasses on the other hand can impart both a trendy as well as stylish look, but one must select the frame with utmost care as it can make or mar one’s fashion statement. Neckties and Scarves - It was in ancient time that a tie signified social status. Now it is sported as a fashion accessory .It can be further stylized by a fine tie-bar although this will give a more formal look but nevertheless leave an impact. Slim narrow ties can also add a trendy, fashionable touch to your outfit. Watches - It is no longer a timepiece used mainly to know the time but becoming a style statement in itself. A designer watch on your wrist can draw attention to it for many years to come. While choosing a watch you must take into consideration your lifestyle. Casual watches don’t blend in office or formal situations it can create a negative style statement. Belts - The general rule is matching your belt with your shoes which gives a formal look - Black shoes, black belt. But for a rocker look, team a metal studded belt or a big buckle, with some dark skinny jeans. Shoes - A perfect outfit is nothing without the right pair of shoes. It can make or break an entire ensemble. Five pairs one must have are: ankle boot, brown and black dress shoes, sneakers and casual shoes. Here you can come across a well-known ROHIT KAMRA“bandhgala for men” collection!! The bandhgala for men represents India and is the best answer to a formal suit,” “In fact, it’s the elegant Indian way of wearing a suit. Moreover, it is so versatile – it can be formal and also informal, and you can wear it with trousers of the same color or mix and match the jacket and pants.or it can be worn with jodhpurs pant/Breeches For a casual look”. A bandhgala for men is a hip-length jacket with a stand-up mandarin collar, cut high on the armhole, it sits snug on the chest and looks best in black or charcoal. As a formal garment it is unbeatable, Men in India have a strange relationship with the bandhgala for men—or the Jodhpur coat as some call what, at one time, was also referred to as the prince coat. We all like to look our best. 5. Go easy on the aftershave and cologne. Many men go overboard on this, assuming that more is better. Well, more is not better-more can be nauseating to everyone else around you. Follow these tips, and you will definitely make a good first impression on anyone. 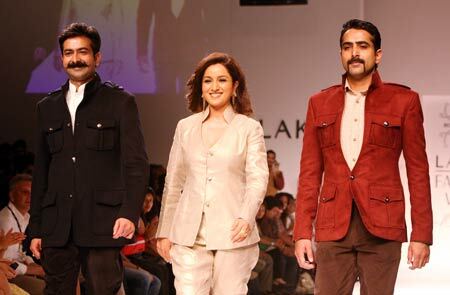 Tisca Chopra, who is revelling in the success of her recently released Nandita Das filmFiraaq, walked the ramp for new designer Rohit Kamra at the Lakme Fashion Week recently. Rohit and abhishek kamra -renowned fashion designer and couturier tells Aaj ka Jaipur about their journey to becoming brand Rohit and abhishek. It was a collection that spelt royal regalia from the studios of Rohit and Abhishek Kamra when the male models strutted down the ramp for ‘Woven Gold’ - a non-profit organisation started in 2008 to promote Handloom and Khadi has been a successful venture for the duo.